This is a part of an occasional series where we look at a club’s spell with a particular manufacturer. At present, the others are Arsenal: the adidas years and Barcelona: the Kappa years. Tottenham Hotspur’s six-year kit deal with Hummel from 1985 to 1991 was notable for a few reasons, most notably the fact that the club and the manufacturer’s UK arm effectively went into business together, as part of Spurs owner Irving Scholar’s diversification plans. Full details are sketch – a forthcoming book on the history of the Spurs shirt will reveal more – but this piece outlines some of what went on. Of course, this is Museum of Jerseys rather than Museum of Business Deals, so we are focused on the aesthetics. Spurs wore three different home shirts and, barring shadow patterns, each only featured white and navy, two colours more than capable of complementing each other without the need for a third. The German firm (no, not originally Danish, though Danish-owned now) used trim elegantly and sparingly, compared with later efforts and thankfully, they felt that dicking around with the sleeves wasn’t necessary. What was a big departure with the new home kit, however, was the fact that the shorts were white, a look Spurs generally only favoured when playing in European competitions. Our friend Jay from Design Football has a fairly sound theory that changing a noticeable element of a kit in such a way is okay if the overall proportions of the strip stay the same, i.e. if the missing colour is reinserted elsewhere. While that didn’t happen, there certainly was more navy on the shirt, in a very dynamic pattern which utilised Hummel’s famous chevron motif. This was the kit that Diego Maradona would wear in Ossie Ardiles’ testimonial in 1986, and when Arsenal visited White Hart Lane they wore their yellow away kit due to fears of a clash because of the amount of white on show. The away copied previous makers Le Coq Sportif’s use of light blue, and diagonal stripes again abounded. With no navy shorts or socks to wear when clashes arose with the home kit, Spurs instead mixed and matched the white and sky-blue. At Manchester City in August 1985, the white-blue-white look – a reverse of City’s – and the sunny weather coupled to cause such confusion that the hosts actually left the field soon after kick-off and returned in their red and black away shirts and shorts with the home socks. The blue socks were called into action with the home kit for the trip to Southampton. Goalkeepers Ray Clemence and Pat Jennings were given plain shirts with subtle shadow stripes, very similar to the Le Coq offerings. In the summer of ’86, a new third kit was introduced, the first time that such a strip had been marketed by the club, presumably keen to maximise sales and profits from the Hummel tie-in. Despite the fact that Spurs (and Arsenal) had had to switch from navy to yellow away shirts in the late 60s as the Football League deemed them too close to the black of the referees’, the new shirt was a dark blue version of the away. Small differences were the absence of the chevrons from the sleeve and white contrast collar and cuffs with a navy stripe. There was a change on the goalkeeping front, too, with a style matching the outfield shirt used. The third shorts and socks were used when required in away games with the white shirt, and also in three home games with Arsenal in 86-87 – the 100th North London derby in January, the League Cup semi-final second leg and then the replay after the sides finished 2-2 on aggregate. 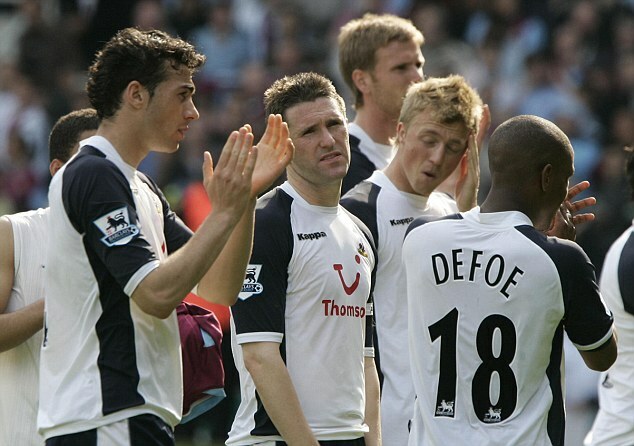 The white-navy-navy look was used away to West Ham United. The navy shorts would return as first-choice on the second Hummel home kit, but its first outing was in the all-white format against Coventry City in the FA Cup final at Wembley in May 1987. On first glance, it was a very plain white shirt, but there was a pleasing herringbone fabric pattern, while the Hummel sleeve tape was also present, albeit white-0n-white. Due to a snafu, however, half of the Tottenham players played in shirts without the logo of sponsors Holsten. Come the start of the 87-88 season, the navy shorts were back in situ, and they were present too on the navy strip, which was upgraded from third to second choice. It also received new socks to match the home set. Mixing and matching again occurred, with navy shirts and white shorts used at Sheffield Wednesday. However, as Richard Totis points out in the comments at the bottom, the sky blue was soon reinstated to second-choice kit – the navy must have been too troublesome for officials. Though the home style had changed, the pattern remained on the goalkeeper shirts, albeit without the contrasting raglan sleeves. There was also a brand-new away kit for 1988-89, and it was to last three seasons, until the end of the Spurs-Hummel association. In the classic yellow, it had the newest iteration of the chevrons, larger but fewer, low on the sleeve, with black navy [see comments] the chosen trim colour. The ‘Hummel’ wordmark was repeated through the fabric, with every second line upside-down – this also featured on Aston Villa’s new kits. Also of note was the fact that the crest on the shirt and socks (oddly, not the shorts) was rendered in colour. A year later, the new home kit would take some of its cues from the away – ‘THFC’ now featured in the fabric as well as ‘Hummel’ – while also representing a gradual evolution from its predecessor. Real Madrid were wearing something very similar at the time, too. The new goalkeeper shirts featured a totally new style, one which could have gone atrociously wrong but carried just enough subtlety to work, in our view. The low placing on the logos on some green versions was questionable, however. With Everton and Chelsea both still in blue socks and Arsenal nearly a decade away from switching away from red, there was no call for a dark pair to be worn with the home kit. Against Wimbledon and Chelsea, though, white shorts were used, and Gary Lineker wore the long-sleeved home shirt (featuring extra chevrons) as he scored the winner at Stamford Bridge in January 1990, representing Spurs’ last league win there. In 1990-91, Spurs would reach the FA Cup final – Paul Gascoigne’s wonderful free kick in the FA Cup semi-final win over Arsenal at Wembley remains the iconic moment for that kit, we feel. However, for the final against Nottingham Forest, a new Umbro kit – with noticeably longer shorts – was worn, denying Hummel a fitting swansong. Since 2000, the brand has only been seen in the Premier League on Aston Villa, while Barnet in 2007-08 was the company’s last English contract. Hummel has rightfully reunited with the Denmark national team, though, so hopefully this can be the springboard for a return to wider prominence. Spurs will switch from Under Armour to Nike in the summer of 2017, but we’d love to see the chevrons at White Hart Lane again in the future. * The yellow away strip trim is navy, rather than black. Or it is on the replicas, at least! * I think the additional chevrons on the forearms of the long-sleeves version of the yellow shirt were not present in 1988/89 and only added from 1989/90 onwards. Thanks for that Richard, I’ll make the amendments tomorrow. I had always thought the trim on the yellow away was navy and then began to second-guess myself looking at pics like this – https://omarseilleuk.files.wordpress.com/2013/06/photo-01-06-2013-16-36-11.jpg – your explanation regarding the crest makes perfect sense! I have just remembered one more crest oddity! In 1983 Spurs introduced their new badge featuring a combination of the cockerel & ball plus lions and scroll. However, for some reason, there seemed to be at least three different iterations of this badge created with 1 version appearing on the playing strip, a slightly different version sometimes appearing in print and on various memorabilia and a very different 3rd version again appearing in print, most notably in the club handbook and match programme. When the 1st Hummel home shirt appeared it featured an embroidered badge that was very similar to the version used on the previous Le Coq Sportif shirts, and the same badge also featured on the sky blue and navy shirts plus the yellow away in 1988/89. However the home shirt also at times featured a version of the badge that was in-line with the very different design that normally only featured in the handbook and programme. This version of the shirt appeared in 1985/86 and particularly, from memory, during the second half of the 1986/87 season. On this version the badge and plus both the Hummel and Holsten logos appear to have been printed directly onto the shirt material, along with the chevron and pinstripe design, making the players shirt, at least visually, identical to many of the replicas on sale at the time. Cheers Richard! I did come across some inconsistencies in my research and did wonder if it was a player/replica split, good to know the story behind it! And I suppose Spurs did wear grey at the Emirates a few years ago too. I think until the Levy-era Spurs were one of the most inconsistent clubs in terms of how the club badge was portrayed across media, merchandise etc. and, on the playing shirt itself it seemed to change (to some degree at least) with almost each new kit! With regards to the linked picture (Sheffield Wednesday away) that’s still the first ‘Hummel cockerel’, with blue cockerel & lions and white ball, as opposed to the full colour version (white cockerel & ball, red lions and yellow scroll) which appeared the following season. (The first ‘Hummel cockerel’ badge featuring the white ball appeared, I think, on the sky, navy and yellow shirts as well as the first two home shirts from Hummel although the white ball itself would not be as obvious on the home shirts!). Brilliant piece, many thanks. 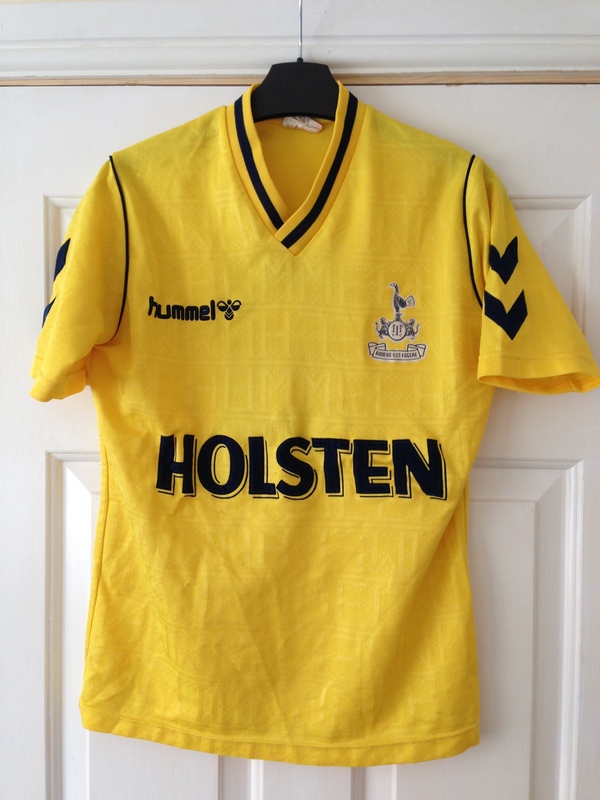 The 1985 home shirt remains my favourite THFC top. May I add a couple of things ? At West Ham in 1986-87, Spurs wore all sky blue in both League & League Cup matches, the white-navy-navy combo WAS used at Aston Villa on the opening day. There were a couple of occasions where navy socks were used with the second & third home kits, at Charlton & West Ham in 1987-88 & 1988-89, and again at Charlton in 1989-90 when the third Hummel shirt had been introduced. The 1987 F.A. Cup Final was the second “kit fail” against Coventry that season, and they ended up borrowing Coventry’s yellow away shirts (with navy shorts/socks) in the game at Highfield Road in December 1986. In fairness Hummel has been a Danish-owned company since the 70s but I really enjoyed the article. I loved Spurs Hummel kits – there was something very crisp about them, particularly the all white kit circa 1987. Yes, Hummel IS a Danish company. It has been since the late 70s. Thanks Kevin and Olli, I did mean it was originally German as it came as a surprise for me to learn it. I’ve clarified the article.